I love cooking pasta because it is so versatile making it in different ways such as Creamy Garlic Parmesan with Shrimp and Vegan Creamy Pasta. Both versions are great because one is perfect for if someone wants more protein. Meanwhile, the other recipe is great for when you want something super healthy and also happen to be vegan. 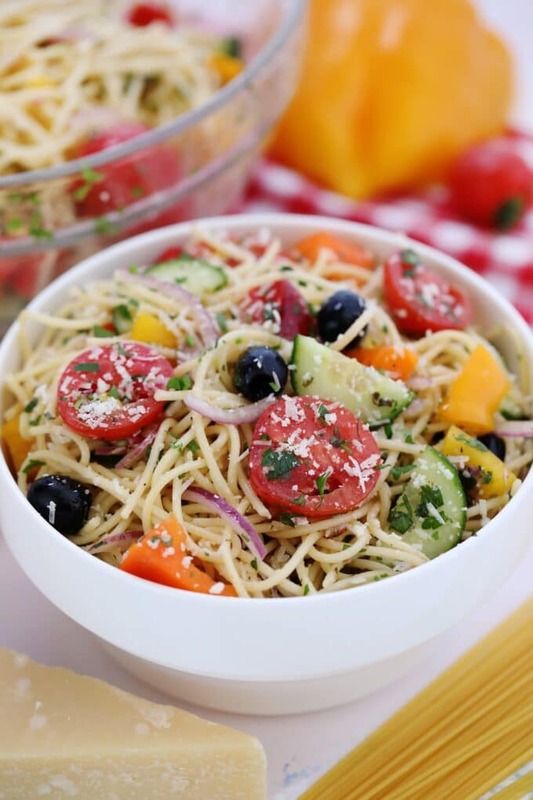 Spaghetti Salad is very colorful and filled with fresh flavors and lots of different textures. I really love making this meal because of how easy it is. Not to mention the fact that you can make this in just twenty-five minutes with prep and cook time. I make this dish with my friends all the time. It is great to bring to a party, potluck, picnic or to serve your family. 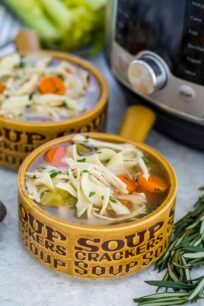 Whether it be a larger or a smaller group of people this recipe is perfect for any group size. The key to making this recipe delicious is in the dressing, but also in how you cook the pasta. Cook it by making it Al dente because it helps it stay firmer for longer. What is also so great about this recipe is that once you finish making it you can put it in the refrigerator and have it the next morning. I love that this is served cold because it is great for on the go. Take it to lunch and don’t even use a microwave. This is great for leftovers! 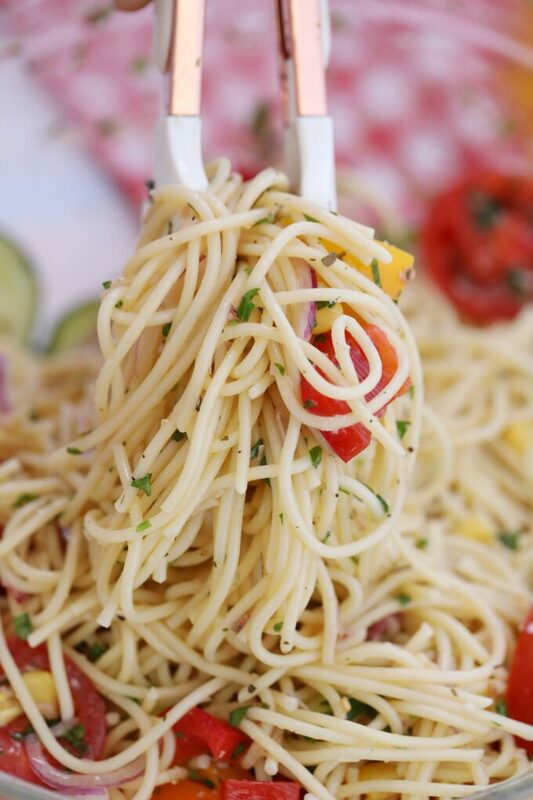 Do you serve spaghetti salad cold? Believe it or not, this dish is actually served cold. As soon as the pasta is cooked to al dente, let it cool and add all the other ingredients to complete this dish and enjoy! How to cook the pasta for spaghetti salad? Cook pasta until it is al dente or for approximately ten minutes. By doing this the inside of the noodle will have a thin layer of uncooked noodle and the outside will be cooked all the way through. This allows for the noodles to be firmer, but not crunchy. Can you eat cold spaghetti? Of course! You can practically eat anything cold. 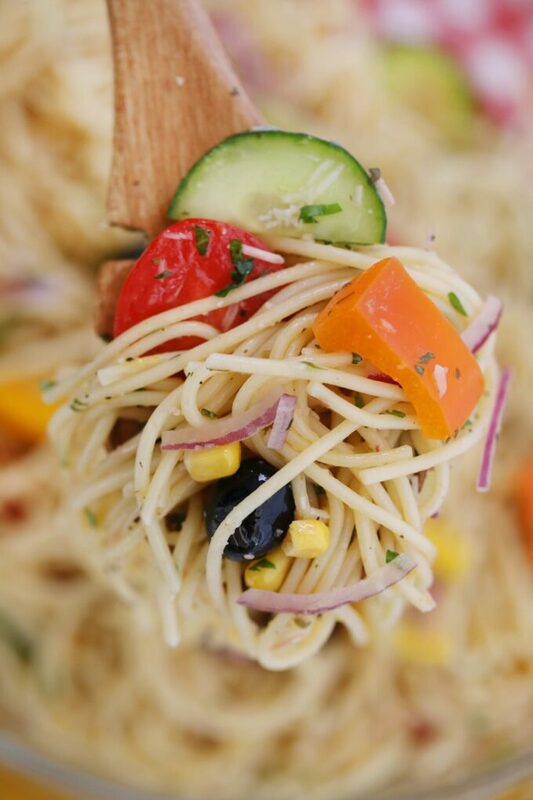 It is pretty weird eating something like spaghetti on its own cold, but when combined with lots of veggies and salad dressing it tastes absolutely delicious. Beans, for a protein boost. How long does spaghetti salad last? It takes approximately five to seven days for the pasta to go bad. This also usually has to do with the salad dressing. However, vegetables in foods also tend to taste strange once they are in the refrigerator for too long. Try consuming this salad with two days. 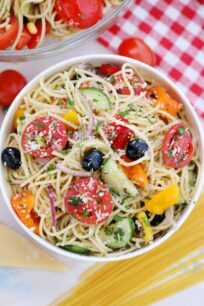 How to store spaghetti salad? Storing this dish is extremely simple. Just take a container big enough to fit the leftovers and place the leftovers inside the container. Cover it with a top and place it in the refrigerator! Can you make spaghetti salad with chicken? Yes, you can make this with chicken. 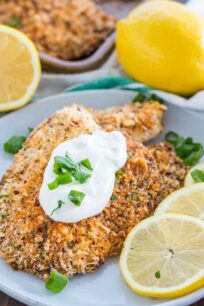 I would recommend keeping the chicken simple and just adding some salt and pepper when cooking it rather than adding more spices. Since the classic way of making this dish is by serving it cold, grilled chicken on top would taste delicious. The best salad dressing to use for this recipe is Italian salad dressing. You can either buy this dressing from the store or make it on your own. To save some time, you can always go with your favorite store-bought version, or use our recipe for Homemade Italian Dressing. Using Italian Dressing also keeps the salad lighter in calories. You can always just use some olive oil, balsamic vinegar and a squeeze of lemon juice. For a creamier version of this salad, you can use Ranch dressing or even Caesar. While it will pack more calories, it will taste heavenly. Cook the spaghetti per package directions and aim for al-dente. Drain and rinse under cold water. Once drained, add them to a large bowl. Add the rest of the ingredients, except parmesan cheese. Pour the dressing over the pasta and vegetables, use as much as you like. Toss to coat. Taste and adjust for salt and pepper. Sprinkle parmesan cheese on top and garnish with fresh parsley. Salad can be made up to 4-5 hours in advance. What a delicious salad idea! I’m going to make this for a potluck we’re going to this weekend! Love this! This just be my new go-to for BBQ’s and pot lucks! 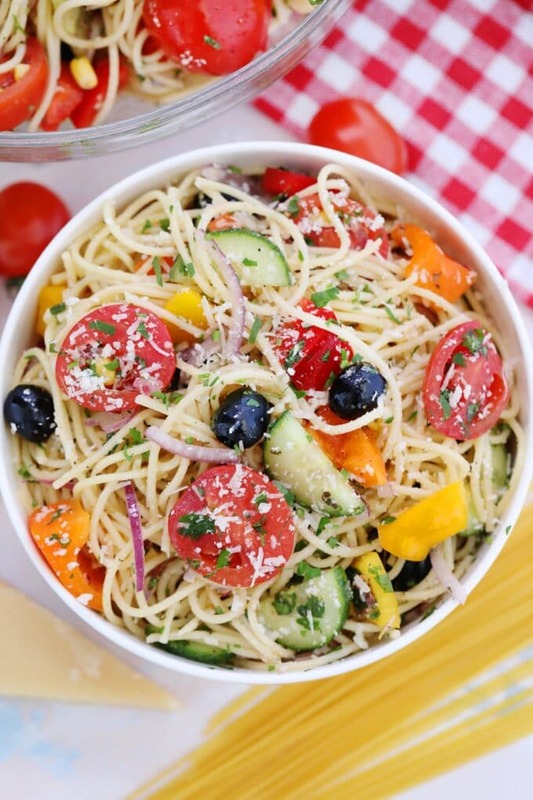 I don’t think I had ever seen a spaghetti salad until I ran across this recipe. SO GOOD! What a good looking meal, and so much flavor! This would make a great lunch or dinner; yum! Looks really fabulous! 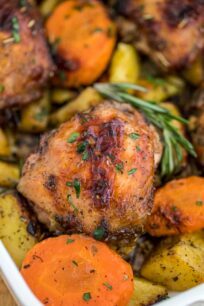 Love those flavors and chunk of veggies, need to make this soon!